Nicholas Bennett died in 1848 and by 1851 his son Reverend Nicholas Bennet has built the 10 houses that run across the end of the road. The houses are built in “pairs” with gardens to the back facing south east. The architecture is simple, with little ornamentation. The semi-detached was becoming increasingly popular as a compromise between terraced houses, which offered no direct access to the rear and detached villas which were expensive to build. Barnsbury Square in Islington which was developed between 1834 and 1847 contains similar small semis on the north and south sides of the square alongside terraces, larger grander semis and villas. The census shows that the 10 houses are occupied by 41 adults and 23 children. All the houses are occupied by more than one family except number 6 where Augustus Butler a lithographer and family live. This is for 2 parcels of land, bordered to the south by a piece of land on which Bennett has recently erected 10 cottages – the 10 cottages at the end of the road. 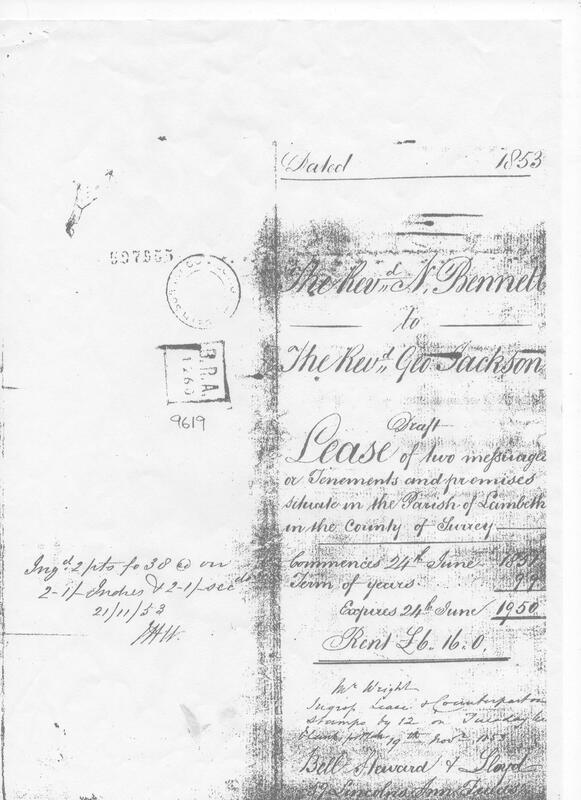 This indenture made the 25th day od December 1853 between the Reverend Nicholas Bennett of No.26 Royal Crescent Notting Hill in the County of Middlesex Clerk of the one part and the Reverend George Jackson of Plymouth in the County of Devon Clerk of the other part Witnesseth that in concern of the costs incurred in erecting the two messuages or tenements hereinafter demised and of the rent and covenanter hereinafter resply reserved and contained on the part of the said George Jackson his exors amore and assigns to be paid performed He The said Nicholas Bennett hath demised and leased And these presents doth demise lease unto the said George Jackson his exors and amore and assigns All those two several plotspieces parcels of land with the cottage messuage or tenement now standing on each piece of land lying and being together on the north east side of ? New Road called Archbishops Road communicating with Somers Place and Brixton Hill in the Parish of St. Mary Lambeth in the county of Surrey abutting South West on the said Archbishops Place Road northeast on a private road belonging to Alexander MacDononald Lockhart Esq, and north West on other ground belonging to the said Nicholas Bennett and now forming part of the Garden of Agnes Villa in the occupation of Thomas John Smith Esq South on the ground belonging to the said Nicholas Bennett on which he has recently recited ten messuages or cottages of the two pieces of ground ? in the front as well as in the rear thereof 17 feet. Nicholas Bennett still owns the Garden of Agnes a bungalow at the end of Archbishop’s Place. There are now 22 houses on the south-west, 10 houses to the south-east and 22 to the north-east. The houses to the north-east have gardens at the front. Merredene Street has not yet ben developed. 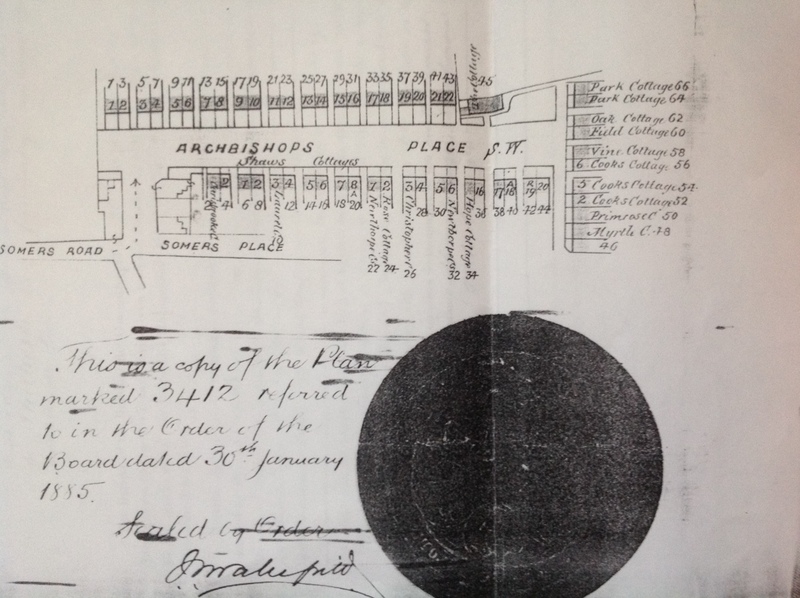 We know from an 1886 indenture where George Balls purchases Nos 5 , 7 27,27 33 and 35 Archbishops Place for £770 that there was a lease between Nicholas Bennett and William Hey for the term of 99 years from the 24 June 1851 at the yearly rent of 3 pounds 8 shillings for each piece of ground and cottage. Rev. 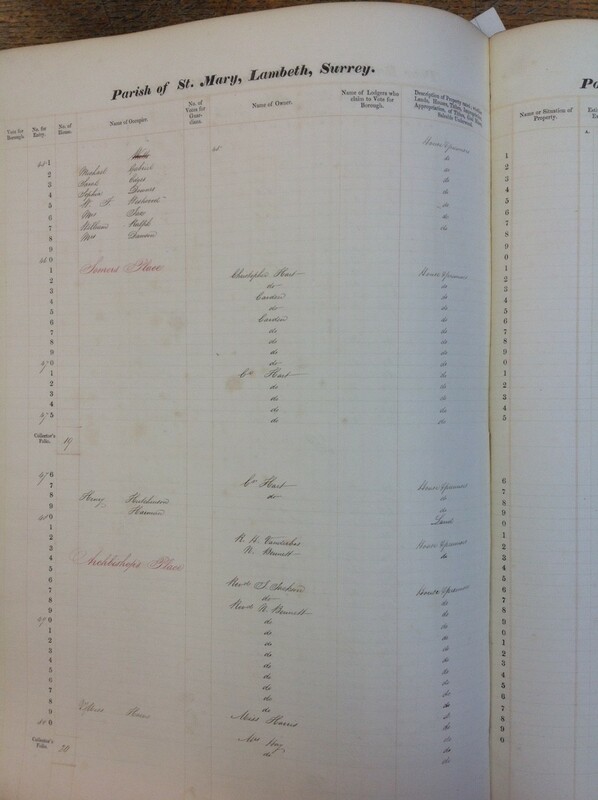 N. Bennett also owns property in Somers Place occupied by Nelson Curtis the carpenter that he leaves to him in his will. 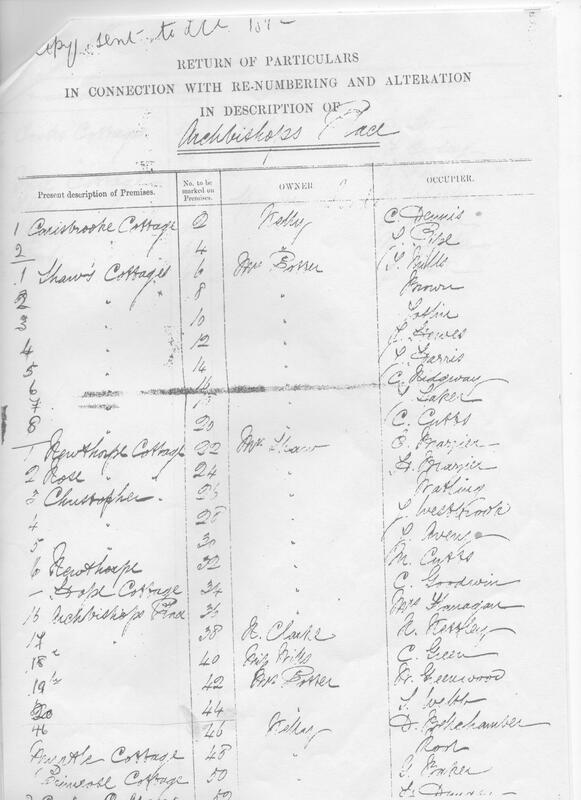 R. H Vanderbosse is also shown as the owner of a house. Christopher Hart owns numerous properties on Somers Place. A labourer could expect to earn roughly 15 shillings a week and a watchmaker around 25 shillings. The Rev. Bennett died in 1875. In 1886, after the death of Elizabeth Bennett (Rev. 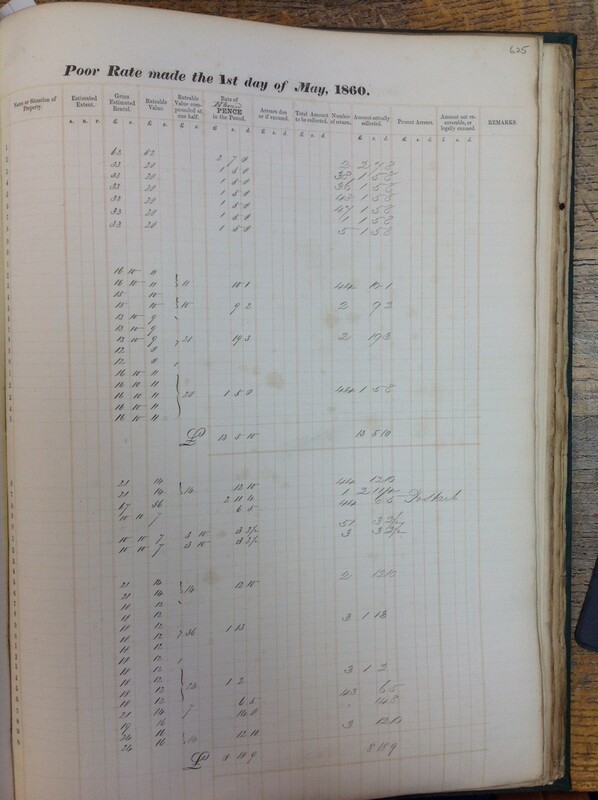 Bennett’s wife) the previous year (3rd July 1884) numbers 5,7,25,27,33 and 35 are sold to George Balls for £770. 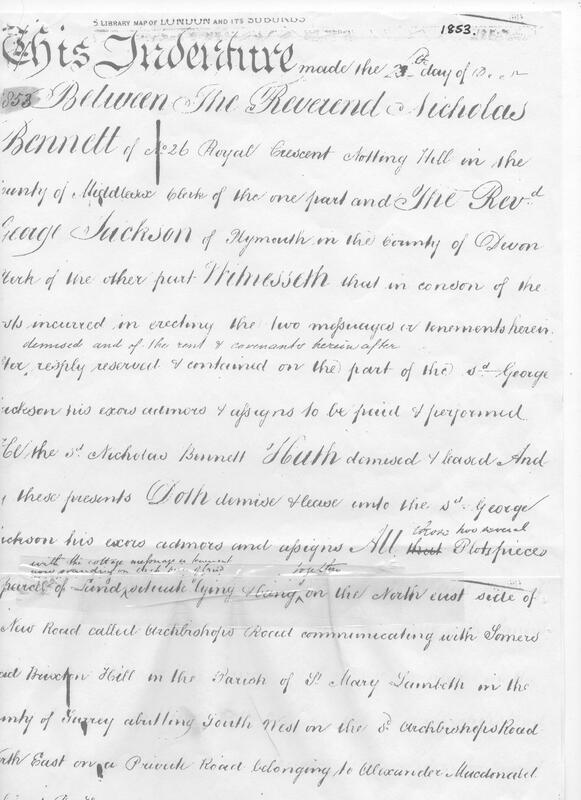 Whereas the said George Neeves, William Henry Williason and Frederic William Steward as trustees of the will of the said Elizabeth Bennet have contracted with the said George Balls for the sale to him of the hereditaments hereinafter described and conveyed in fee? simple free from incumbrance over the lease hereinafter mentioned for the sum of £770. ???? ??? ??? that in pursuance of the said contract and in consideration of the sum of £770 the said George Neeves, William Henry Williamson and Frederic William Steward as trustees hereby convey and confirm unto the said George Balls first ALL those four cottages or tenements with the yards forecourts gardens and appurtenances thereto respectively belonging situate on the north east side of Archbishops Place Somers Road Brixton Hill in the County of Surrey and know respectively as Nos 27,27 33 and 35 Archbishops Place aforesaid And Secondly All those two cottages or tenements with the yard forecourts gardens and appurtenances thereto respectively belonging situate on the North East side of Archbishops Place aforesaid and known respectively as No 5 and No 7 Archbishops Place aforesaid. All ?? which six several cottages and premises are more practically delineated on the plan drawn in the margins hereof found and and therein colored brown and pink. ?? the said hereditaments of the said George Balls in fee simple subject as to hereditaments first described ? ?but with the full benefit of an Indenturef Lease dated 28 May 1852 and made betwee the said Nicholas Bennett of the one part and and William Hey of the other part whereby the hereditaments first described were leased unto the said William Hey his executors administrators and assigns for the term of 99 years from the 24 June 1851 at the yearly rent of 3 pounds 8 shillings for each piece of ground and cottage and under the Lessess covenants and conditions therein contained. ??? whereof the said parties to these presents have hereunto set their hands and seals the day and year first above written.